I’ve been trying to follow the suggestions from the Sunday Strategist at Cooking Light magazine. So far I am very happy because I am losing weigh slowly (naturally) and am feeling great and eating lovely food. 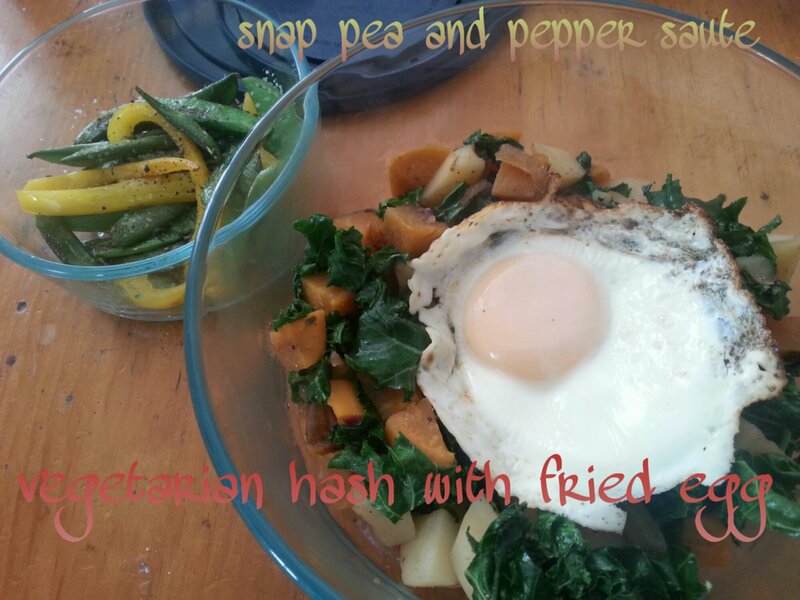 They call this a vegetarian hash because it consists of vegetables cut up small and no meat. The protein comes from the egg. You can prepare the egg any way you prefer, but lots of people like it either sunny side up or over easy so that the white part is cooked and the yellow is runny. I suppose the fashion is no more hard boiled eggs. In a large nonstick skillet, heat oil over medium heat. Cook onion until tender and starting to brown, about 5 minutes. Add thyme and garlic and cook 1 minute, stirring. Add potato and 1/4 cup water, cover, reduce heat to medium low and cook until potatoes are tender. Stir in kale, spinach, season with salt and pepper, cover and cook about 3 minutes to wilt greens. Remove pan from heat, but keep warm. In another skillet, fill with water until about 2/3 full. Bring to a boil, then reduce heat to a simmer. Add vinegar. Break an egg into a custard cup, then gently pour into the skillet of water. Cook until done, about 3 minutes. Carefully remove with a slotted spoon. Plate 1 1/4 cups of the hash on a plate and top with a poached egg. Repeat for remaining dishes. Drizzle with hot sauce if desired.